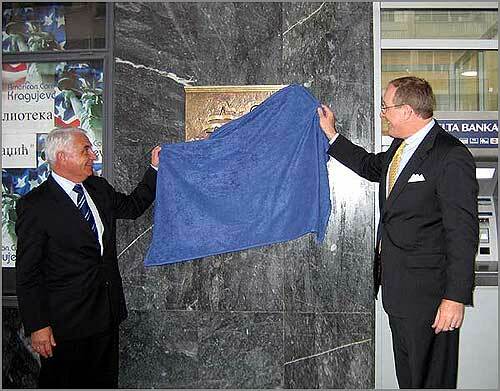 The Corners are small, American-style libraries created to increase mutual understanding between Serbia and the United States by making available information about America in a variety of formats. We offer books, videos, CD-ROMs, Internet Access, various programs and professional bilingual librarians trained to help you find the desired information about the United States. 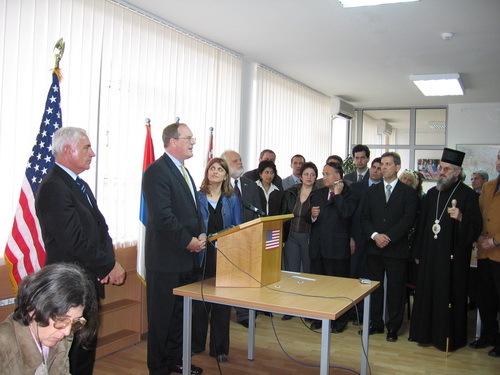 His Excellency Mr Michael Polt, ambassador of the United States (speaking), the mayor of Kragujevac Mr Veroljub Stevanović (left), and other public dignitaries on the grand opening of the American Corner in Kragujevac, May 2005.